I already need a holiday detox. And it is still only October. All those spooky sweets I have been sharing, plus all the Halloween candy I ‘accidentally’ snuck into and ate, plus developing and tasting more sweet (and hearty) recipes for the upcoming Thanksgiving and Christmas holidays…. So whenever I need a break from all the junk all I crave is a salad. A main dish salad for dinner. 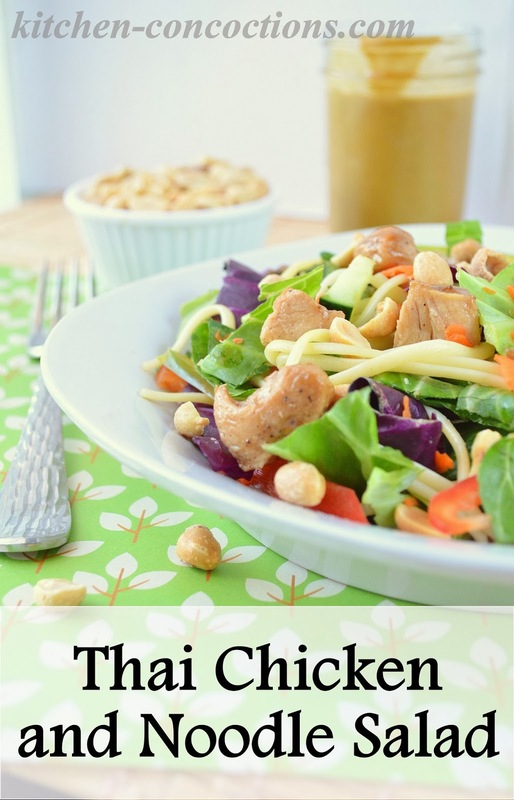 This Thai Chicken and Noodle Salad with homemade Thai Peanut Salad Dressing was the perfect fit in my current sweet filled diet. 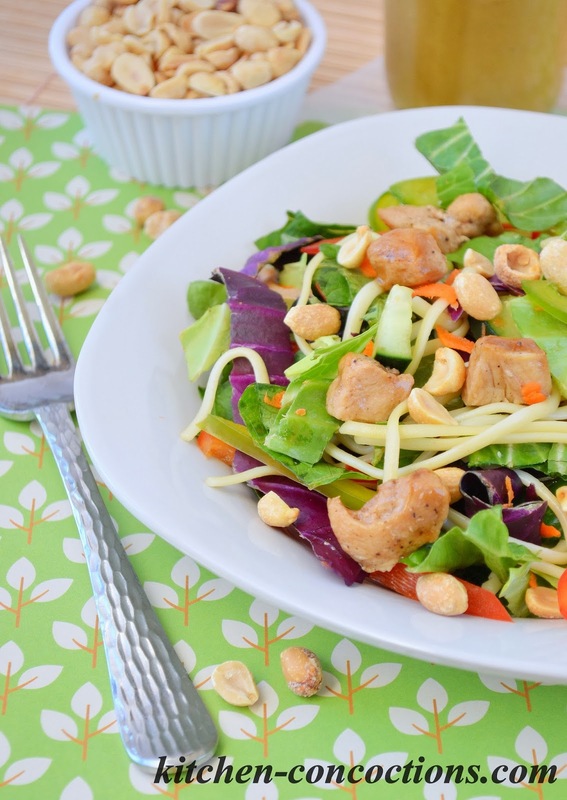 Loaded with good for you vegetables; some juicy tender chicken, perfectly cooked pasta and a slightly *sweet* yet spicy homemade Thai Peanut Dressing. Which, by the way, will be my go to Thai Peanut Sauce/Dressing from here on out. It is the perfect balance of flavors, and unlike the store bought sauces, you can adjust the spices if you can’t handle the heat. Place chicken in a large zip top baggie. Add teriyaki sauce and toss to coat. Let chicken marinate for at least 30 minutes. 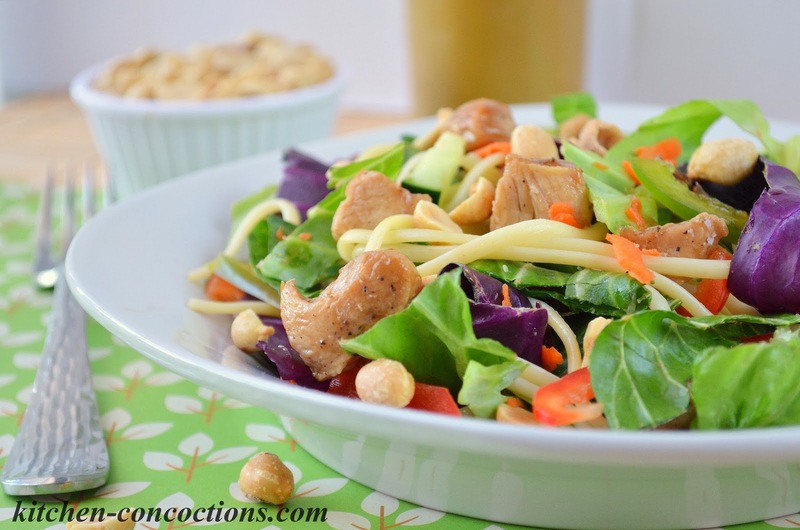 Meanwhile, chop vegetables and prepare Thai Peanut Salad Dressing (recipe below). Bring a large pot of salted water to a boil. Add pasta and cook for 8-10 minutes, or until desired tenderness. Drain pasta. Drizzle with 1-2 teaspoons oil and set aside. While pasta is cooking, heat remaining oil in a large skillet over medium-high heat. Remove chicken from marinade, and discard marinade. Add marinaded chicken to hot skillet and cook for 4-5 minutes per side, until cooked through. Once chicken is cooked, cool until easy to handle, and cut into bite sized pieces. In a large bowl toss together prepared vegetables, cooked pasta, and cooked and cubed chicken. Add prepared Thai Peanut Salad Dressing right before serving, and toss to coat. Combine all ingredients, except oil and water, in a large blender. Blend for 30-40 seconds. Scrape down sides. Turn blender on low speed and slowly drizzle in oil until combined. Blend in water until desired consistency is reached. Taste and adjust seasonings to preference. Dressing can be stored in an air tight container in the refrigerator for up to one week.